This park is close to a 10 rating when compared with other Alaska parks. Parking on the "fishing hole" is more expensive but it is really convenient to be able to stay in the warm/dry RV while waiting for the salmon to show. Plus even when not fishing watching the seals feed is entertaining! Silvers were in when we were there and "snagging" opened the day before we arrived. There were a lot of good fish snagged every day we were there. Office staff was very friendly. Individual shower rooms were very clean with plenty of hot water and good pressure. WiFi was marginal and we were next to office. Cable TV available but we didn't hook up. (To much other cool stuff to do and see!) We camped at Heritage RV Park in a Motorhome. Cpt Patty's chowder and fish fettuccine are both outstanding! If you have a towed take the time to go high on the hill in town to get the overall view of Homer Spit. If it is a clear day the glaciers on the other side of the bay are very pretty. Little Mermaid has excellent rock fish and chips! High volume campground with a good staff and an incredible view. We had a waterfront campsite which was very enjoyable if overpriced. Our family members on board tried to use the showers and on some days had to use our RV shower because of the long lines. Their snack bar provided a good selection. Without the view, the rating would drop to a 6, but the view... that makes the campground. We camped at Heritage RV Park in a Motorhome. The actual entrance is before you reach the office - you have to turn in and then follow a gravel road to the registration stop, so watch carefully as you approach. Our highlight of the RV trip was our flight from Homer via Alaska Bear Adventures to Katmai and to Lake Clark National Parks to view brown bears in the meadows after landing on the beach. You stay here for the fabulous views & location on the bay. A bonus is the nice front desk staff & clean showers/restrooms/laundry which are monitored by an attendant. Yes, the sites are really close together and there is no privacy, but the view and location are mesmerizing. The CG is in walking distance to the end of the Homer Spit and there is a walking path into town, but it is a bit of a hike at over/around 2 miles. If you love to fish, this is the place as we watched people snagging salmon within minutes. There is also a stocked pond adjacent to the property. Not sure about the price per night as we were with an Alaska RV tour group. Must unhook the tow before getting to your site. Pretty level sites and we were lucky to get water front where you pull in with windshield facing the water from the RV. We camped at Heritage RV Park in a Motorhome. If you like bakeries The 2 Sisters Bakery near Bishop's Beach is amazing. Also, the Farmer's Market has great produce & bakery items. The Pratt Museum is worth a visit. Very clean well maintained friendly staff. We camped at Heritage RV Park in a Travel Trailer. Call in advance they stay full. This park has $1m Views and not much else. We had a head in site and booked it back in December to make sure they could accommodate us. We got to our site and could not see how to easily fit, yet small class Cs were in much larger sites. I went back to the office and asked for help to "fit" into the site and was told they did not care as long as I stayed within the curbs. We made it work but we using every inch of the site. We had 2 days of high wind and discovered that since they have not graveled their roads/sites in years that we were in a dust bowl. Our rig was covered in dirt. Utilities work 0k, cable would degrade during the evening. Wifi was spotty during peak hours. We camped at Heritage RV Park in a Motorhome. We stayed here for a month so we were able to get the monthly rate. We were not on the water but a row back from it. Once the park got full there were only views of the other RVs. Very stable power, great water pressure and our site was level. Great location on the Spit (Southern tip of the Kenai Peninsula). The wind got to be a little much for us but we knew it was going to be windy being on the Spit. The laundry was nice and clean. I guess the only complaint really would be they don't cut the grass/weeds which became very over grown at our site. Great Eagle watching area. We camped at Heritage RV Park in a Motorhome. Tons to do in Homer. We loved Fat Olives and the Kannery restaurants. Lot's of fishing to be done in Homer. We packed the RV freezer full of Halibut/Salmon and was still able to ship 51lbs home. Grewingk Glacier hike is amazing! You can have a wonderful view of Alaska the mountains, water and snow caps. Place is prime for an RV stay. It's all gravel. You need a car to get food or you can take a trolley which is $15 a day. RV laundry is $5.25 a load - Really? Save your washing for another RV park. Pastry and coffee are priced way out of site. This RV park is located on the main drag. 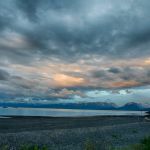 If you're going to Homer or Homer Spit this is where you need to stay, people are friendly and the beauty of this area is yours to enjoy. We camped at Heritage RV Park in a Motorhome. Great location on the water on the spit in Homer. The sites are gravel with tables and a fire pit. Good 50 amp hook ups, water and sewer. We pulled in straight facing the water, had a great view of bay, mountains and glaciers. We camped at Heritage RV Park in a Motorhome. The spit has fun shops and good restaurants. Salty Dawg is a must see. We had great clam chowder at Captain Patties, and a great lunch and dinner at Chart Room. We loved our boat trip to Halibut Cove. We also enjoyed The breweries in town. As in all real estate you always want Location, Location, Location. Boy does this place have it all. Beachfront with an ocean view out both sides, mountains and glaciers everywhere, walking/biking distance to fishing or dining or shopping. We used our bikes to get around a lot of the time since there is a paved walking/biking path that runs the entire length of the Homer Spit. Our Dish satellite worked well so we didn't try the cable. Their wi-fi was free but didn't work well at all so I finally gave up and used our Verizon wifi. There are no fire rings in the actual campground, but our site backed right up to the beach and we had a big bonfire several nights burning mostly driftwood we found on the beach. I agree that the sites along the beach are meant for Class A's to pull into, but we have a 5th wheel and backed in. This meant our utilities had to come across the site, but our neighbor behind us let us use their sewer connection a couple of times to avoid that hassle. Most sites are very tight, but somehow we managed to get one that was very wide and we had plenty of room for our awnings. The price is very high, but this is the only place on the Spit we even considered staying. Make reservations 2-3 months in advance if you want beachfront. We camped at Heritage RV Park in a Fifth Wheel. Get fresh oysters in bulk at the Oyster Coop on the Spit. The Chart Room at the Lands End Resort at the end of the Spit has awesome views on the deck for drinks or dinner. 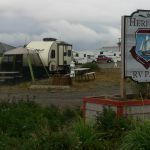 Yes, it's expensive; however, in our experience it is the best RV park in Alaska. The view from the oceanfront sites is incredible. We have stayed here many times over the last 13 years and the experience is always the same; we come away satisfied with our stay. The oceanfront sites are almost twice as wide as most other parks. Our 43' 4 slide pusher fits with room to spare and that's unusual in Alaska. Sites are level and easy to get into. The oceanfront sites have rock fire pits. Bring plenty of wood. The utility's are contained in a proper lighted utility pole. Power outlets are tight and breakers work. The sewer opening has a heavy hinged cover. Others have complained about the cable but it's always worked for us. The wifi can be sketchy but it is provided by another company and is out of the park's control. The office people are friendly. There is a coffee shop and laundry/showers with an attendant. There is a free to use gas grill and a putting green. They have plenty of space for boat trailers etc. 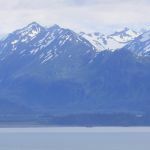 You are close enough to easily walk to all the restaurants, gift shops, and other tourist attractions on the Homer spit. No other park in Homer even comes close. We camped at Heritage RV Park in a Motorhome. Heritage Campground was great. Request a reservation for a front row site facing the ocean/bay,the sites all come with a table and a fire ring and the views cannot be beat. Albeit the sites are a little close together there was enough room to park the RV and a car along side of it and we still had plenty of room in front. It is however a bit pricey at $73 per night W&E and S. Now this is Alaska so we are talking about a dirt lot with no trees, but it was a nice level dirt lot lol . It is also close to town, approximately 2 miles and about a mile to the end of the spit. If you are here to fish or to sight see or Kayak, this is a great place, be sure to make reservations as soon as possible. Our AT&T cell service was very good We camped at Heritage RV Park in a Motorhome. WiFi and cable were insufficient. The cable connection was very corroded; and, they only made excuses for the WiFi, never fixing either. 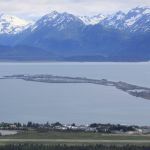 The campground is more of a gravel parking lot with power posts, but is representative of what is available on the Homer spit. We camped at Heritage RV Park in a Motorhome. Lots of shops on Homer Spit. Parking is at a premium. Trolley service, while available, didn't seem worth the cost based on the limited hours of service it provided. We stayed here for five nights. There are beachfront sites, but they are pull-in sites for Class A and C units. Backing in would require running your services under your RV, which is not that bad, but you also lose the use of your awning and sitting area outside your door. Because of this, we opted for a non-beachfront site, which was still nice and gave us a beautiful view all around. 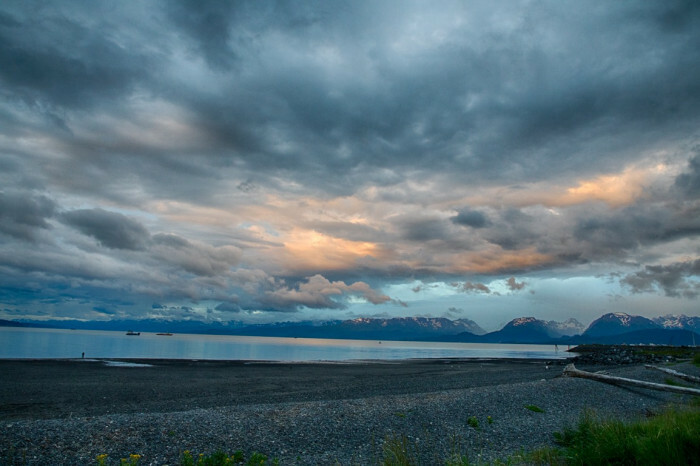 It is a very easy and pleasant walk to any place of business on the Homer Spit. We did two fishing charters and walked to the meeting spot both mornings. We felt the price is a bit high, but you are paying definitely paying for location and full amenities. The park was very clean, as were the indoor facilities. We never could get the satellite tv to work, but spent so little time inside our RV that it really wasn't missed. We love the Homer Spit, so we would stay here again if we return to the area. We camped at Heritage RV Park in a Travel Trailer. Great park with a view to die for. All hook ups were located where they should be and all worked great. The cable did not work at our site but was able to get several channels from antenna. Park close to town with shopping and close to fishing charters and other boats for wildlife site seeing. Sites where level and plenty of space between sites. We camped at Heritage RV Park in a Motorhome. Views to die for. Location was perfect for shopping on the spit. Level sites to pull in with utilities that actually worked as a 50 amp. Our WiFi worked, several others just a short distance away did not. Verizon not so dependable. Only complaints: cigarette butts all over our campsite, and a very cramped laundry room with nowhere to fold clothes and folks squeezing past the washers and dryers on the steady stream to the showers which are manned with an attendant at all times. Be prepared to show her your pass to use any of the facilities. There is a nice coffee shop in the office which sells espresso and has a nice area for seating. Espresso not so great and office help seems a bit untrained on the weekend, but no real problems. Certainly one of the more beautiful spots we have stayed. We camped at Heritage RV Park in a Motorhome. Take the Danny J ferry/The Saltry restaurant combo tour to Halnut Cove. A magical experience full of picturesque village, 5-star food, lazy boardwalk stroll, and spot some sea wildlife during the boat ride. Lunch or dinner, they fill up fast so call for reservations. Thus was a memorable experience.